Craving some traditional American cuisine, or looking for a place to perch before, during or after a Giants game? A new sports bar in SoMa has you covered. 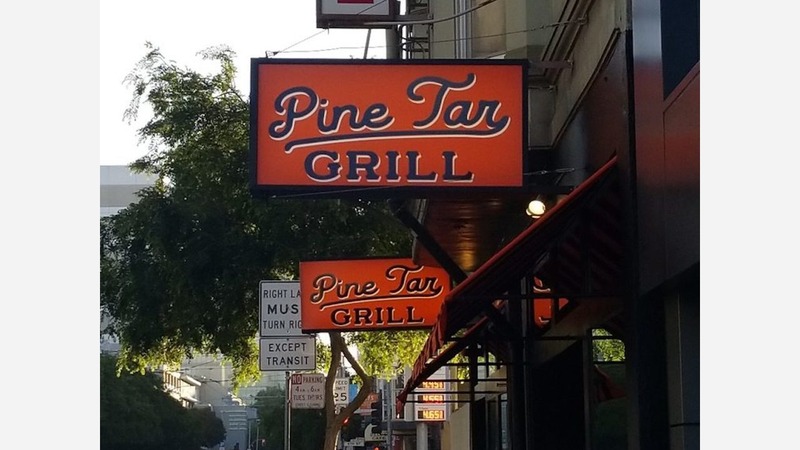 The fresh addition, called Pine Tar Grill, is located at 917 Folsom St. between Fifth and Sixth streets. According to the business, the spot "is a nostalgia-fueled Giants themed full bar and restaurant serving upscale comfort food and drinks." The bar and restaurant area are adorned with several HDTVs, old baseball bats, and plenty of San Francisco Giants memorabilia and artwork. With a 4.5-star rating out of four Yelp reviews, Pine Tar Grill is off to a good start. Tanya C., who reviewed the place on June 22, wrote, "This is a pretty awesome with the SF Giants theme. I brought my 10-year-old nephew here who's a big Giants fan. It's a great place for kids and family. A lot of space, very friends staff and the food was pretty big that I can share with everyone." Yelper Elisabeth R. added, "I am a huge Giants fan and this place has some great art work and memorabilia that really makes the place come alive. They have only been open for a little less than a week so it's a great place to stop by and get a drink in SoMa without waiting a long time at the bar." Pine Tar Grill is open from 8 a.m.-9 p.m. daily.